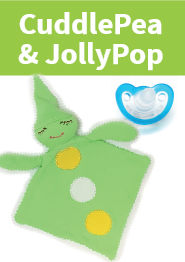 JollyPop Pacifier & Plush RaZBuddy - cuddly companion for your little one. 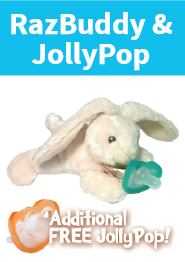 JollyPop Pacifier & Plush RaZBuddy - cuddly companion for your little one. Comes with a FREE JollyPop Pacifier! A stylish way to hang onto your pacifier. Sandbox Baby offers a wide variety of safe products designed to comfort and care for your baby. 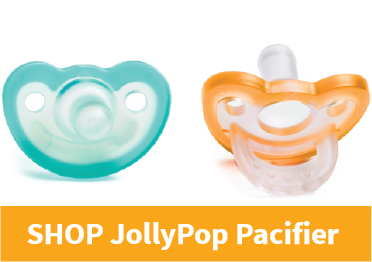 While we are best known for JollyPop pacifiers for babies, which are used in both hospitals and homes, we also offer bonding dolls, swaddlers, teething rings, rattles, comfort squares, personalized baby gifts, and a lot more. 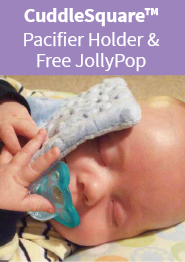 Many of our newborn baby products can be personalized with embroidery, and many come with a free JollyPop pacifier. You can purchase products individually or in sets, and our gifts and bundles are outstanding ways to save money and get a variety of themed and matching items for a baby. In particular, our personalized baby bundles make very special baby shower gifts. 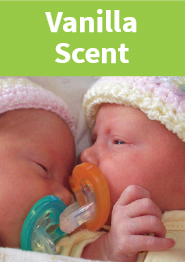 Don't forget to look through our selection of items for diaper rash, teething, and soothing infants. We focus on offering natural products that don't rely on artificial ingredients such as Hyland's Teething Gel, which is free of parabins and artificial flavors, and Bella Bee Honey Bum Diaper Butter, made with organic ingredients. Orders of $25 or over get free shipping anywhere in the US, or flat $6 shipping to Canada! Soothie® is a Registered Trademark of Children’s Medical Ventures, Phillips. GumDrop® is a Registered Trademark of Hawaii Medical LLC, Natus Medical Inc. Copyright © 2013 www.jollypop.com. All Rights Reserved. Built with Volusion.